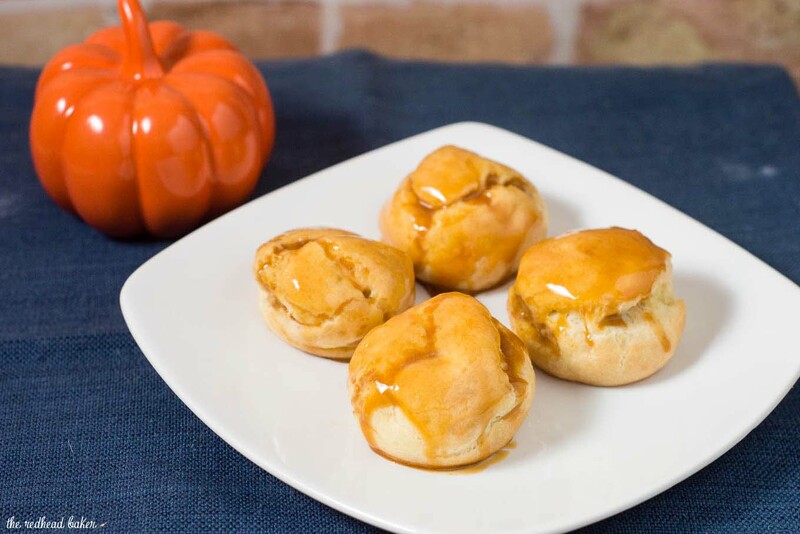 Pumpkin cream puffs are filled with creamy pumpkin custard and dunked in caramel glaze. You’ve never had a pumpkin dessert like this before! Today’s treat is one that I made for a Halloween party many years ago, and it was a HUGE hit. I mean really, who doesn’t love cream puffs? Little round balls of pastry with a burst of cream inside! 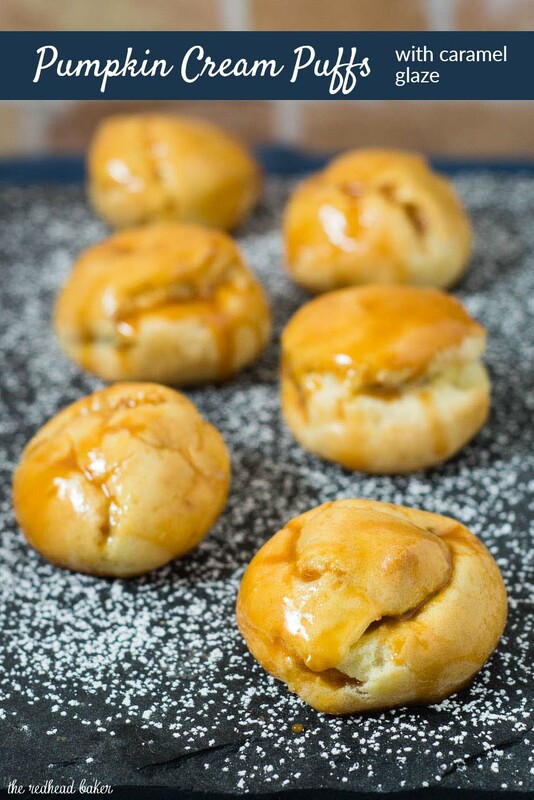 Instead of pastry cream, however, the filling for these pumpkin cream puffs is pumpkin custard. It’s very similar in flavor and texture to the filling of a baked pumpkin pie. Like a cheesecake, it is baked in water bath, for similar reasons. The water bath heats the custard more slowly and evenly, preventing the eggs from curdling and the custard from cracking. Obviously, since the custard is being spooned into a pastry bag to pipe into cream puff shells, cracking isn’t a huge deal. However, curdled eggs still are an issue, so this still bakes in water bath. You may wonder why I add sugar to a caramel sauce for the glaze. After all, caramel sauce IS sugar! 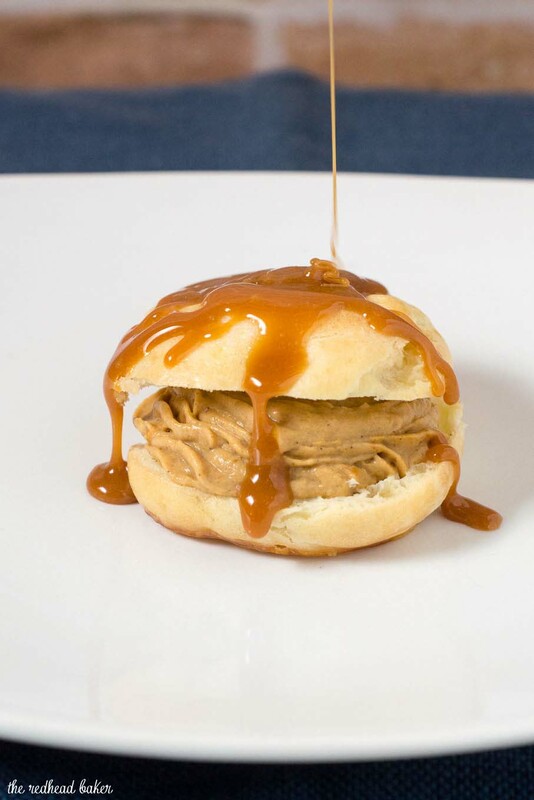 You could simply dip the cream puffs directly in the warm caramel sauce, and they would be absolutely delicious. But the caramel would never really set up the way this caramel glaze will. It’s really a personal preference. So, yes, these require a lot of effort, but I assure you the results are worth it. If you want to attempt them but feel intimidated, I recommend tackling the parts of the recipe one day at a time. Day 1, make the custard. Day 2, make the pastry shells. Day 3, fill the shells, make the glaze, and dip the cream puffs. Bring water, butter, and salt or sugar to a boil in a heavy-duty saucepan over high heat. Add flour and work mixture together until it forms a ball. Continue working the mixture in the pot, until most of the moisture is boiled out. Poke your finger in the dough. It should be shiny (from the butter), but not wet from water. The dough will start to leave a film on the bottom of the pan. Transfer mixture into bowl of a standing mixer and let cool for 3 or 4 minutes. With mixer on stir or lowest speed add eggs, 1 at a time, making sure the first egg is completely incorporated before continuing. The mixture will appear to separate -- this is expected. Keep beating until the dough comes back together before adding the next egg. Once all eggs have been added and the mixture is smooth put dough into piping bag fitted with a plain round tip with a 1/2-inch opening. Pipe dough into golfball-size rounds, 2 inches apart, onto parchment lined sheet pans. 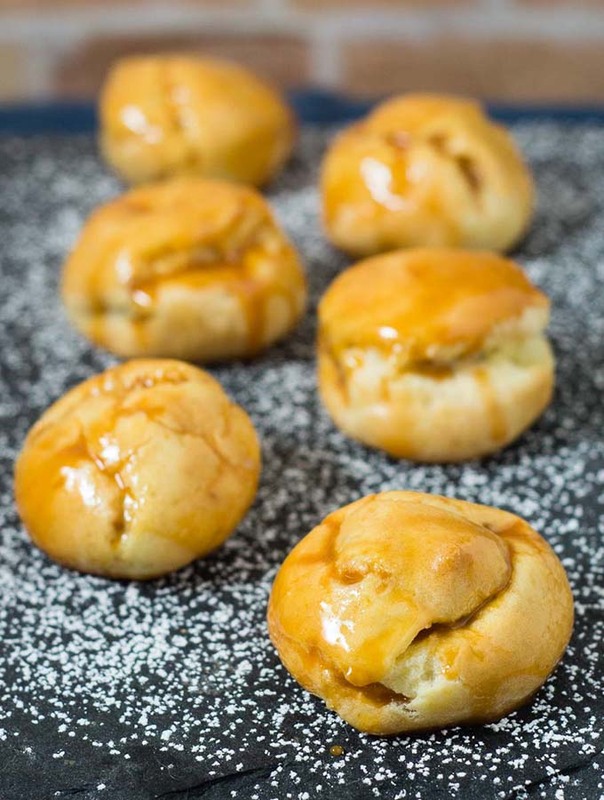 (TIP: Pipe a small dollop of dough directly onto the cookie sheet, then place parchment on top — then the parchment won’t lift off the cookie sheet when you pipe your cream puffs.) Alternatively, portion the dough out with a large cookie scoop. Continue with the remaining dough. When finished, dip your finger in warm water, and gently press down on the tops of the cream puffs, to remove the “hat” that forms when you lift the pastry tip away from the piped cream puff. Bake for 10 minutes, then turn the oven down to 350 degrees F and bake for 10 more minutes or until golden brown. Once they are removed from the oven, pierce with a paring knife immediately to release steam, and cool completely on a wire rack. Spoon the custard into pastry bag fitted with small round tip. Insert tip into bottom of cream puff and gently squeeze to push some of the custard into the cream puff. The cream puff is full when it feels heavy, and the tip pushes itself out of the pastry. Refrigerate the cream puffs while you make the caramel topping. Place the caramel sauce in a small saucepan. 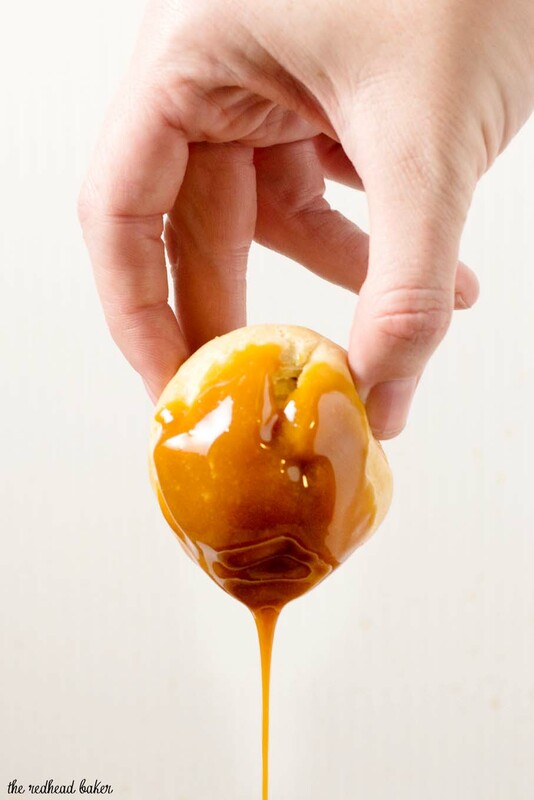 Over low heat, warm the caramel sauce. Add the powdered sugar and stir until combined. 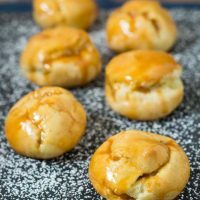 While the caramel glaze is still slightly warm, dip the tops of each cream puff in the topping, then set upright on a wire rack. Let sit until the glaze sets. Store finished pastries in the refrigerator, or freeze for up to 3 months, tightly sealed.